As another new year is upon us, thoughts of becoming more organized, donating household items we no longer use, or repurposing furniture to update living spaces, makes us feel like we’re starting out fresh and new. In the spirit of “Out with the old; embrace the new!” we’ve put together a list of crisp decorating ideas dressed in winter white, for a minimalist and relaxing transition into the next season. A cozy, fireside sitting room. 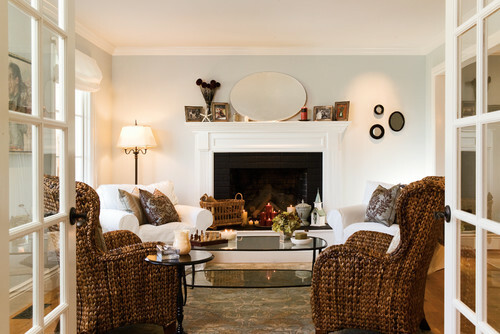 When you think of a cozy room, white isn’t often the color that comes to mind, but this serene fireside sitting area feels warm and relaxing. Like a breath of fresh air, the French doors usher you into the warmth of this neutral space that emanates from the natural seagrass chairs — a perfect contrast to the white elements. Reminiscent of a wintertime beachside retreat, the overstuffed armchairs invite you to grab a good book and settle in for the evening. Casual elegance restores the dining room. Remember how your dining room was all dressed up for the holidays in rich jewel tones? It feels good to get back to basics after the hustle and bustle of the season. This dining room takes a break from the festivities, but is still ready for dinner guests in its casual elegance. Crystals on the rustic chandelier sparkle like snowflakes above the table. The chairs in white slipcovers feel updated and new, while the warmth of the floor adds an unspoken richness to this basic color palette. If you have a view outside your bathroom window that looks like this, it should be the focal point of the space with nothing to distract you from the natural beauty. Along with the deep soaking tub, all you need is enough time to immerse yourself in the picturesque winter wonderland that’s right outside your window. A bedroom retreat for the five senses. A neutral white bedroom palette offers a serene space for slumber and a treat for the five senses. Nothing here will distract you from a good night’s sleep as you settle in to listen to the warmth of the crackling fire; can you smell the logs as they burn? The thick comforter is touchably inviting, and the bed’s position directly opposite the fireplace provides a visual delight as well. Tune out the day and drift off to dreamland in this happy, uncluttered space. Not quite ready for a completely white living room? This space is modern with clean, white lines, but the gray area rug and drapery provide a soft, textural balance to the solid walls and ceiling. 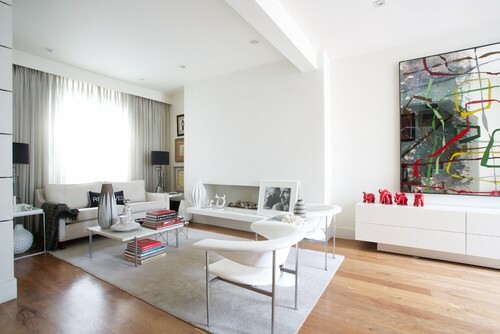 Adding a pop of color with figurines, books, and an oversized wall painting also adds dimension to the living space.